Used Nat's Drinking Hat (+18) and Jeweled Fishing Pole (+13). And to add to this guide, since I don't see it anywhere. 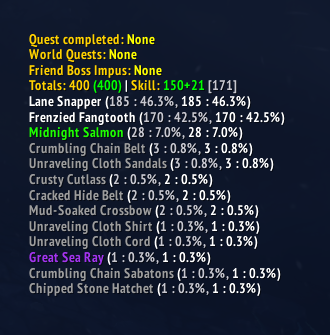 There is this quest Big Gulls Won't Die which rewards you +1 fishing skill and gear that gives +5 fishing. The maximum bonus Fishing skill for Battle for Azeroth is +78, however, only +68 is practical, as you can not use the Underbelly Elixir outside WotLK Dalaran, which gives you +10 Fishing when transformed to Tuskarr. It has to be noted that there is hardly any difference between the amount of trash catched between level 150 and level 218. That said, I have no data on Great Sea Ray or Midnight Salmon for example, higher fishing could benefit the droprates of these items. But again, I have no data, it might aswell make no difference at all.